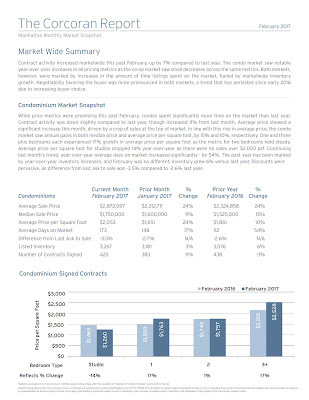 Contract activity increased market wide this past February, up by 7% compared to last year. The condo market saw notable year-over-year increases in all pricing metrics as the co-op market saw small decreases across the same metrics. Both markets, however, were marked by increases in the amount of time listings spent on the market, fueled by market wide inventory growth. 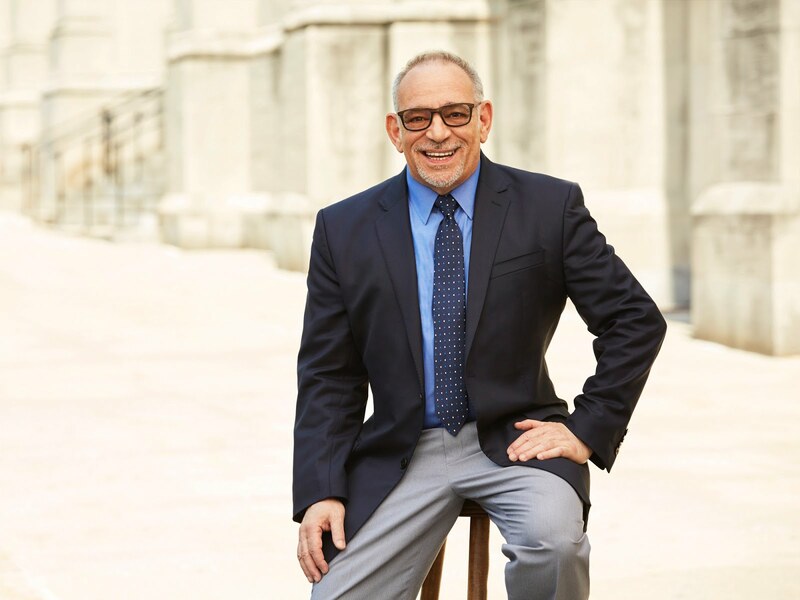 Negotiability favoring the buyer was more pronounced in both markets, a trend that has persisted since early 2016 due to increasing buyer choice. 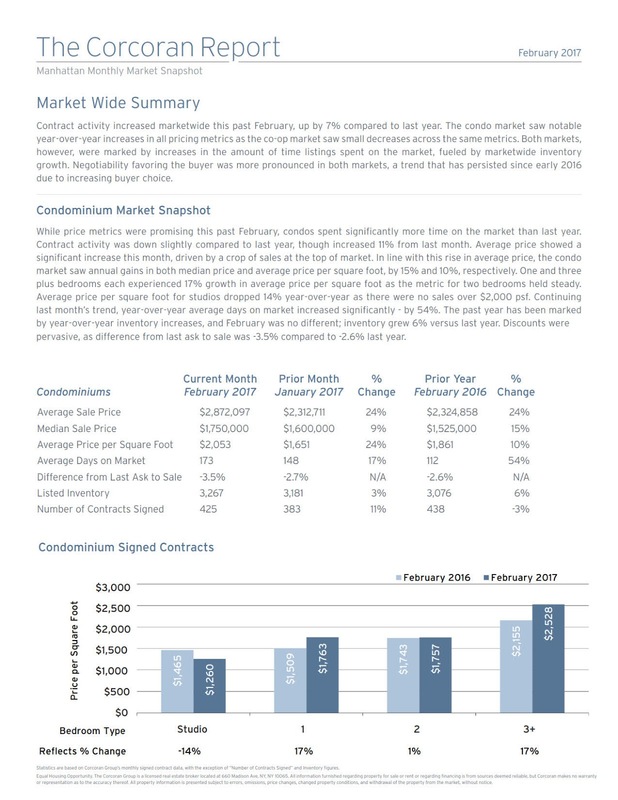 While price metrics were promising this past February, condos spent significantly more time on the market than last year. Contract activity was down slightly compared to last year, though increased 11% from last month. Average price showed a significant increase this month, driven by a crop of sales at the top of market. In line with this rise in average price, the condo market saw annual gains in both median price and average price per square foot, by 15% and 10%, respectively. One and three plus bedrooms each experienced 17% growth in average price per square foot as the metric for two bedrooms held steady. Average price per square foot for studios dropped 14% year-over-year as there were no sales over $2,000 psf. Continuing last month’s trend, year-over-year average days on market increased significantly - by 54%. The past year has been marked by year-over-year inventory increases, and February was no different; inventory grew 6% versus last year. Discounts were pervasive, as difference from last ask to sale was -3.5% compared to -2.6% last year. 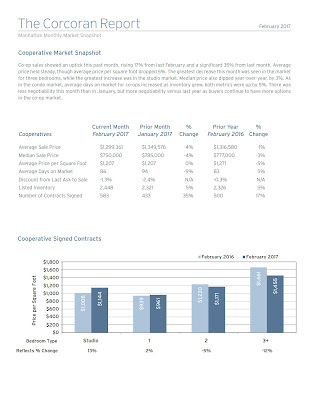 Co-op sales showed an uptick this past month, rising 17% from last February and a significant 35% from last month. Average price held steady, though average price per square foot dropped 5%. The greatest decrease this month was seen in the market for three bedrooms, while the greatest increase was in the studio market. Median price also dipped year-over-year, by 3%. As in the condo market, average days on market for co-ops increased as inventory grew, both metrics were up by 5%. There was less negotiability this month than in January, but more negotiability versus last year as buyers continue to have more options in the co-op market. Typical of seasonality, February’s listings rose after a dip in inventory in the early months of winter. Total inventory was up 6% year-over-year, and condos continued to make up over half of all listings. There were 399 townhouses on the market this month, an annual increase of 6%. As seen in the condo and co-op markets, increasing inventory can have an impact on negotiability and days on market, as buyer have more options and feel less pressure to move quickly. Compared to last February, almost all price categories saw a decrease in sales above ask and an increase in sales below ask. The one notable exception is the market for listings under $1MM. 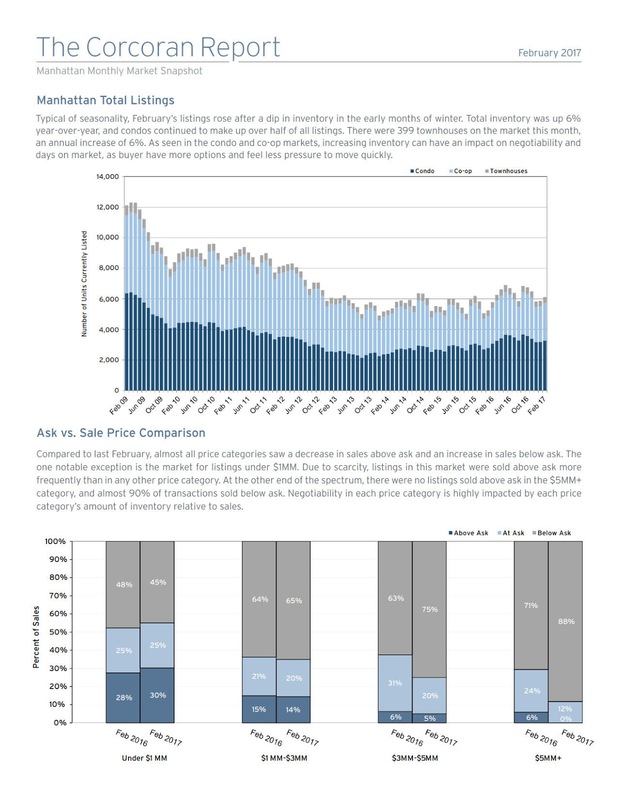 Due to scarcity, listings in this market were sold above ask more frequently than in any other price category. At the other end of the spectrum, there were no listings sold above ask in the $5MM+ category, and almost 90% of transactions sold below ask. Negotiability in each price category is highly impacted by each price category’s amount of inventory relative to sales.